This orange smoothie recipe with refreshing pineapple and basil is chock full of nutrients and bright, fresh fruit that will satisfy your taste buds and your appetite! J has a smoothie every weekday morning. Without fail. Sometimes Nat will have some of it too, but I am not a big breakfast-before-work person, mostly because of time, so I rarely partake in any kind of breakfast during the week. But, when I was thinking up recipes for this week, I wanted to include a beverage, and a smoothie was the first thing that came to mind. 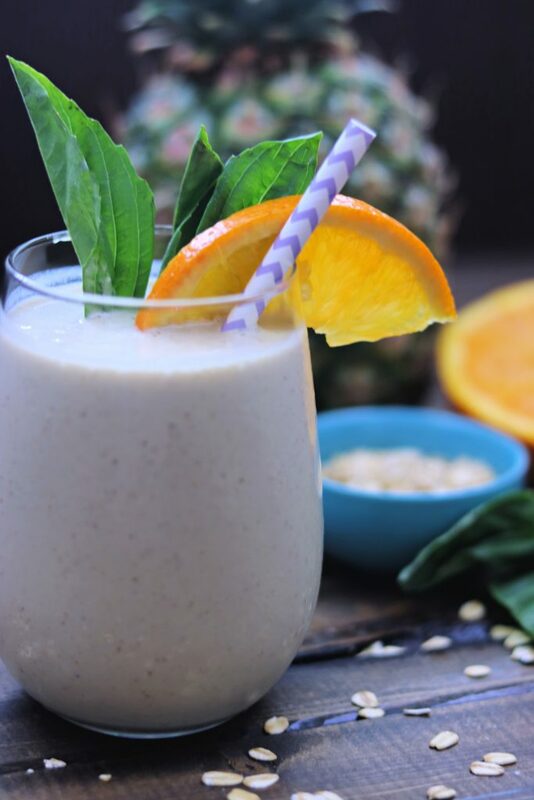 So, I started thinking of good, seasonal spring fruits and eventually came up with this orange smoothie recipe with pineapple and basil added to make it extra refreshing! 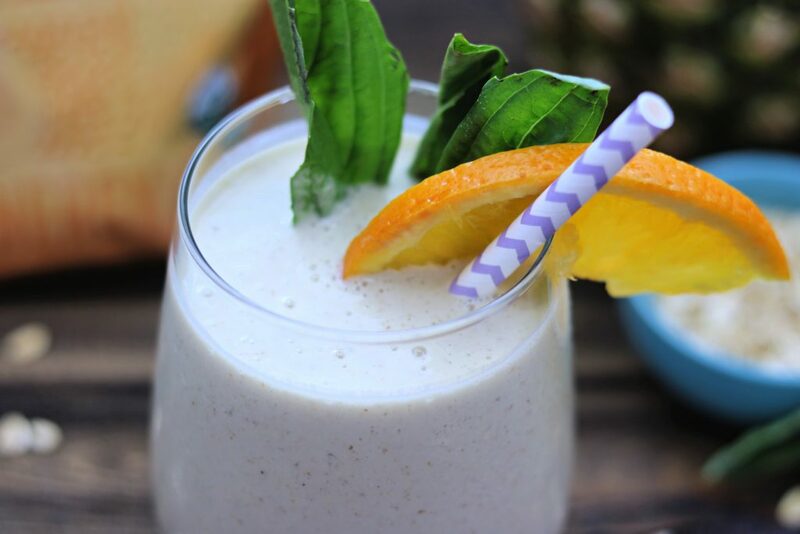 For this kicked up orange smoothie recipe, you need only 7 ingredients and less than 5 minutes to have this deliciousness in your glass. That, my friends, sounds like a great way to start any day! 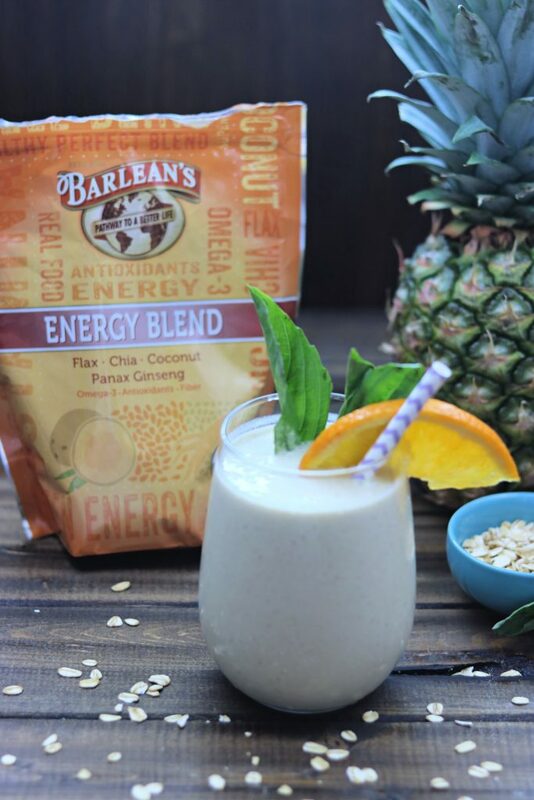 What really makes this a great smoothie – a great breakfast smoothie, is the addition of Barlean’s Energy Blend. 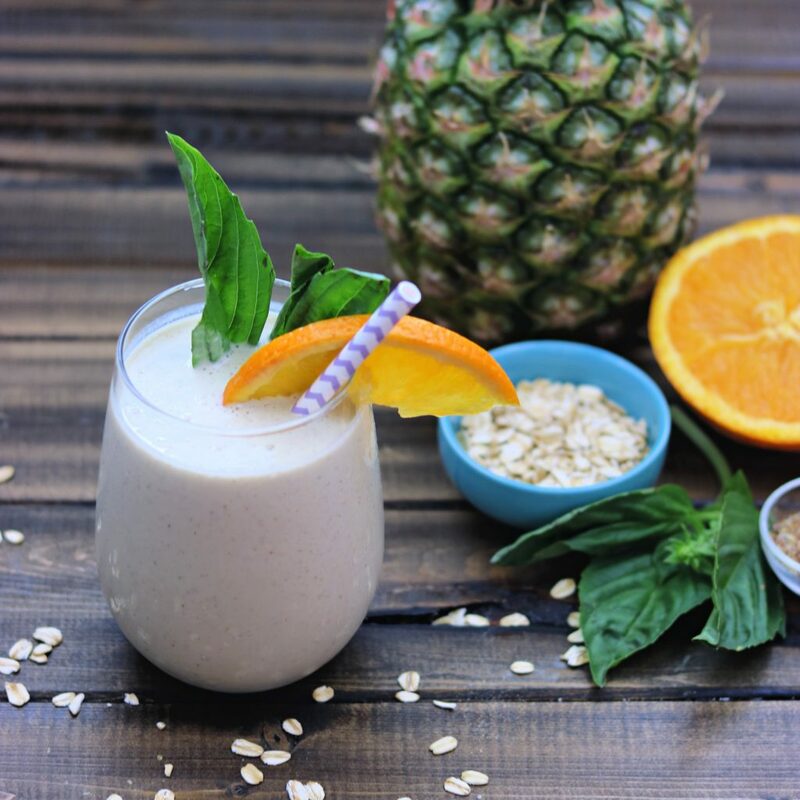 It has flax, chia, coconut flakes, and panax ginseng, as well as Omega-3, antioxidants, and fiber, all to help kickstart your day and keep you going! It also adds a nice texture and added flavor to the smoothie. 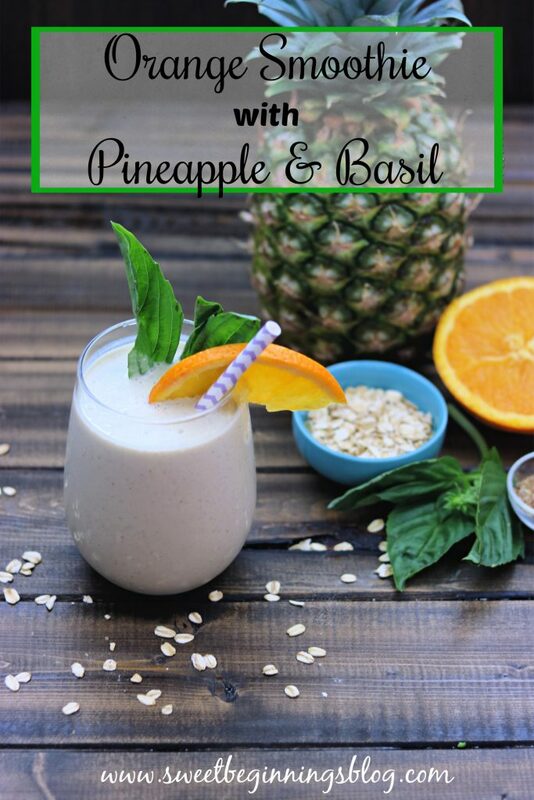 It took a couple of test runs to get the ratio of ingredients just right (too much basil is NOT good), but the end result was a phenomenal smoothie that is healthy, refreshing, and filling. That’s about the best thing I could hope for! When I did the final run on this recipe, I gave J the morning off from making his breakfast and I made smoothies for us ALL to enjoy! He told me I could make it the next morning, too, so I guess he liked it? No doubt that you will, too! And, you guys! Today is my last post for Spring Sweets Week! But, you do have one more day to enter the amazing giveaway! Don’t miss out on your chance to win 1 of 8 prize packages from our generous sponsors! 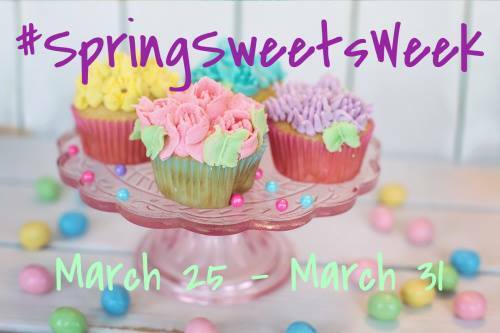 Check out the recipes from the final day of Spring Sweets Week! 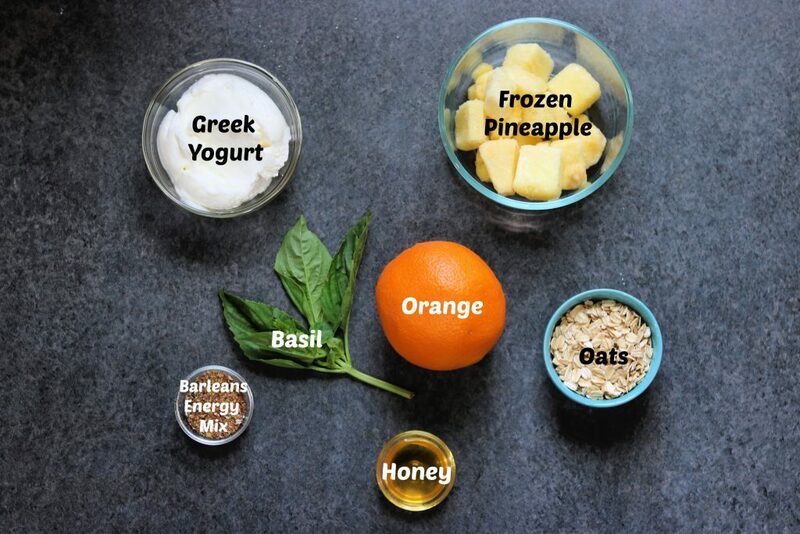 Are you ready for the orange smoothie recipe, with pineapple and basil?? Here you go! Divide into two glasses, and garnish with orange slices and basil, if desired. *If you prefer to use fresh pineapple, add 1-2 cups of ice.